They weren’t even supposed to be here. 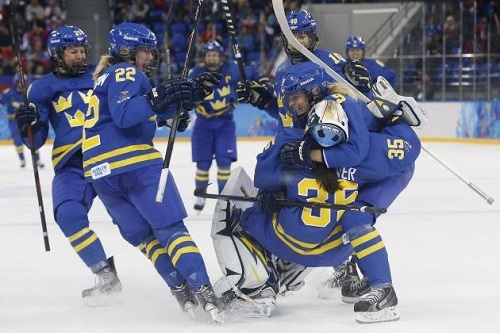 After less than stellar play following the phenomenal upset in Turin during the 2006 Winter Games, the Swedish women’s hockey team was threatened that they weren’t going to be allowed to compete in Sochi. Instead, they play Team USA in the semifinals on Monday morning. Now there’s the upset they were looking for. In Sochi, the Swedes have won three of their four games, with two of those games being shutouts. Their first loss was against Russia who was previously undefeated as well, but Russia went on to lose their quarterfinal game against Switzerland. After three periods of fierce, energetic play, Sweden beat Finland 4-2, but not without many of the attributes of a fierce rivalry game similar to play in the NHL. In a game full of penalties, the first two periods were dominated heavily by Finland, but they faced a solid defense from Sweden. Through 40 minutes, Finland had the lone mark on the board. As soon as the third period begin, Sweden exploded in energy, putting up two goals within the first six minutes of play in the third. Finland answered back shortly after, but the Swedes were determined to hold their own in this game and took a 3-2 lead with six minutes left. A struggling Finnish offense pulled their goaltender, which lead to an empty netter, giving Sweden a 4-2 victory. This victory again is establishing the comeback of this team, after beating a team that previously deprived them of a medal. Monday’s match against the explosive Team USA should be exciting as things begin to heat up with medals on the line.